A true Grand Duo for cello and piano to provide a much-needed connection between the first sonatas for this combination — by Beethoven — and the later 19th-century repertoire. 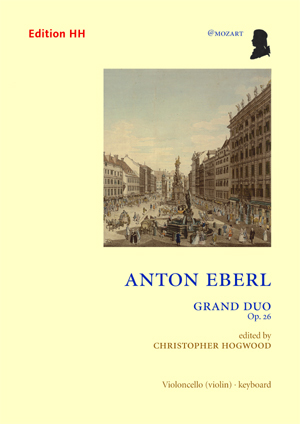 Eberl’s heroic style provides a masterly alternative to the over-familiar works, with the balance of power between the two players scrupulously maintained throughout, and ingenious formal innovations. The Rhapsodie finale in particular, with sections in varying metres and moods, resolves in an elegant Pastorale, an entirely new format for this combination. The composer thoughtfully provided an adaptation of the cello part for violin containing many differences which will be of interest to players of both instruments; both string parts are included in this publication. Musically, this is an extremely attractive piece, which offers a tantalising glimpse into the development of Eberl’s style: in many ways he bridges the gap between the classicism of Mozart and the early romanticism of Beethoven. One can only wonder what else Eberl might have produced, had his life not been so tragically cut short.